Tuna and Hummus Sweet Peppers - A recipe from Savor California, the online showcase for extraordinary gourmet foods and beverages from California. 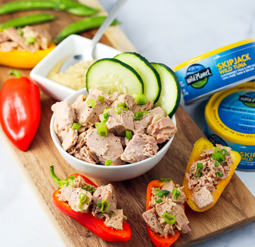 Empty Wild Planet Skipjack Wild Tuna into a bowl and lightly flake with a fork to incorporate juices. In a separate bowl, mix hummus, lemon juice, and black pepper to taste. Gently fold flaked tuna into hummus. Fill mini sweet peppers with tuna hummus mixture. Top with chopped green onion.